The English need to get their minds right about this. My ancestry is Scots, with a strong dash of Irish from my mother’s side of the family. That means I was born with an affinity for cantraip whether it was the spell of a witch or the mischief out of the faerie world. I grew up reading Bobby Burns’s lowland Scots poems and perhaps that influenced me as much as my DNA to always be seeking a fair bit o’ cantraip in every dark wood and every dark woman. Truth be told, I expect that the many worlds interpretation of quantum mechanics and panpsychism will ultimately explain many things that are best-considered cantraip at present. Quantum physics is science and panpsychism is superstition (or so some say), but they have a lot more in common than the followers of either viewpoint are willing to acknowledge yet. I’m enchanted by both–call it a Scots Irish thing. Sleight of hand, it seems, is much easier for audiences to believe in. Audiences want to be fooled, and they are. The great sucess of Penn and Teller is evidence of that. If you saw Tony Randal in the 1964 movie 7 Faces of Dr. Lao, you may remember that the audience was far more excited over the splashy sleight of hand than Merlin’s real magic. The world might be better if we could buy faerie dust at Walmart. We need a wee bit o’ cantraip to give us hope, make us smile, and prove that Washington’s politicians don’t know everything. Vila SpiderHawk is the author of three magical novels that follow the coming-of-age adventures of protagonist Judy Bauman in the disputed German-Polish border territories prior to and during World War II: Forest Song: Finding Home (2008), Forest Song: Little Mother (2009) and Forest Song: Letting Go (2010). Vila is also the author of the Forest Song Cookbook (2009), featuring recipes from the series, and Hidden Passages: Tales to Honor the Crones (2007), a collection of stories about old women and their celebration of life and wisdom. Vila and her husband live in a log house in the Pennsylvania forestland. Malcolm: Welcome to Malcolm’s Round Table, Vila. You introduced readers to protagonist Judy Bauman in Forest Song: Finding Home set in 1929 to 1933 in territory claimed by both Germany and Poland on the eve of World War II. What attracted you to this time and place for your novel’s setting? Vila: Thank you for your hospitality and thoughtful questions, Malcolm. It’s very kind of you to do this interview with me. Why the World War II era in the Polish-German Corridor? I am of German descent and was born in 1945. I grew up in careful silence about the horror of the Holocaust. We didn’t even learn it in school, since it was still too new to be in the history books. It wasn’t until I went to high school that I got my introduction to the period, and that was very sketchy. Nonetheless, I have always felt a pull to the time and place. Call it racial guilt. Call it something else. Whatever it is, I needed to know what caused a people to do such terrible things. And so I studied the era in college. However, I was never satisfied with the answers the books gave for that terrible time, and so I have carried this need around all these years. Therefore, when I met Judy and she turned out to have lived in that time, I invited her in to tell me her story. You see, I do not create my characters. They come to me, fully formed and talkative. Judy is downright overbearing sometimes. In any case, I channeled her, since she, too, cares deeply about the “whys” of things. But there is an additional reason. I worry that our country could become the Germany of the Holocaust. I worry about Guantanamo and the attitude we generally have about Muslims just now. While I am sure some Jews in Germany fit the Nazi stereotype, since all stereotypes have a glimmer of truth to them, I believe and indeed have found that most Jews were just hardworking people trying to live decently and to raise their children well while keeping the bills paid. And, while some Muslims fit the stereotype we have created for them, most, I believe, are like the majority of German Jews. All they want is to live decent lives, to raise moral and educated children, and to pay the bills. It’s not rocket science. People are people. Most are, at bottom, very conscientious. Malcolm: As I read Forest Song: Finding Home, I discovered an interwoven mix of history, German and Polish life and culture, Craft traditions and rituals, and faerie magic. When prospective writers ask what you write about, how do you describe the Forest Song books’ genre and overarching themes? Vila: Oh boy it’s really difficult for me to place the Forest Song series into a tidy little box. I have classified it as historical fiction, since it has elements of that. I have also classified it as fantasy, since it has aspects that people like to call fantasy. But in truth, it doesn’t really fit tidily into any single category. When people ask me what I write about, I usually tell them I write about life, in all its complexities. As is true of all of us, Judy’s is a creature of her culture and her era. Her spirituality is an important aspect of her attitudes as well, as it is with most of us. Sometimes she believes she’s going from point A to point B and she ends up at point H, as often happens in life. My stories are not straightforward, because life isn’t straightforward. This becomes more obvious in the later volumes of the Forest Song series but is already visible in Finding Home. Malcolm: Fairy tales and myths frequently use the forest outside the city gates as a dangerous and/or magical realm of non-ordinary reality where characters go for heroes’ adventures and seekers’ coming of age stories with a strong focus on the protagonist’s transcendent or psychological “the inner journey.” Did a life-long appreciation of myths and folktales greatly influence your approach to Judy’s story and her drive to leave the claustrophobic and limiting world of her parents’ farm for the freedom of the forest? Vila: Fairy tales are highly allegorical. The forest in fairy tales usually symbolizes the darkness and the space in which people reflect and learn, acquiring wisdom. Thus Persephone goes into the Underworld as a child and emerges with a woman’s wisdom and responsibilities. The forest is our Underworld. 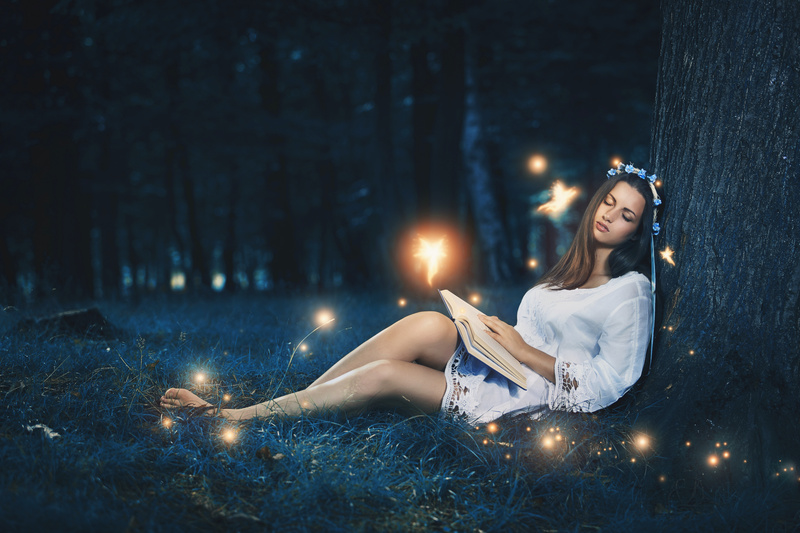 Having said that, I did not grow up reading and loving fairy tales. That came later. But I have always felt the pull of the woods. I always felt I would not satisfy my destiny until I had escaped the clatter, stench, and hustle of the city and had moved into the green serenity of the trees. And, in truth, I didn’t. Though I have always written, it wasn’t until I had moved here and had explored my inner wisdom that I finally felt ready to write for publication. Malcolm: I am amazed at the breadth and scope of the Forest Song books insofar as the author’s personal knowledge and research required for the plot and setting. How did you approach and organize the books’ details so that they fit hand in glove with recorded history, actual trees and plants available (and seasonally, when they bloomed) in the disputed territories, local customs, Craft traditions specific to Germany and Poland at that time, relevant folktales, and even kinds of clothing, furnishings and products available in a typical farm family’s house? Vila: I don’t organize my books. My characters do that. They tell me their basic stories in bare bones language. Then it’s up to me to make art of their tales. Once I have the basic facts, I spend a great deal of time researching. One of the reasons I am such a slow writer is that I try to check every little detail to be sure it’s true. Judy opens herself up to me. She lays herself bare. That requires a great deal of trust. I need to be worthy of that trust. That means that I have to be sure that every detail I include in her story is true. I read many books before I sat down to write this series, and I have read many more along the way. Malcolm: Your pseudonym combines “Vila,” a goddess, with “Spider” and “Hawk.” How did you choose this unique pseudonym and how does its meaning correlate with the intentions and perspectives behind your writing? Vila: I chose Vila SpiderHawk very carefully. Vila is an eastern European Goddess of the woods. She is a shape shifter and the protector of the forest and all who live there. She heals with herbs. I identify with all that. She also dances hunters to death. There are times when I really identify with that as well, since I am a vegan. I chose the name long before I realized I’d be telling Judy’s story, though. Spider is a contemplative creature. Spider spends her time between earth, the concrete, and air, inspiration. She chooses not to hunt. Instead she waits for food to come to her. She is patient. She knows that the Universe will provide her daily needs. She reminds us to see the importance of patience and spirituality. She reminds us to see the divine in all creatures, however small, however mundane. Hawk, on the other hand, is aggressive. Her vision is sharp, and her reflexes are quick. She is a merciless hunter. She soars. She spreads her wings and touches the clouds. She is as free as it is possible to be in this life. I am both Spider and Hawk. I am contemplative and introspective. I understand that the Universe will provide what I need as long as I have the wit to ask for it and the patience to accept that it will come in its own good time. But I am also Hawk. I can be aggressive and merciless. I tend to see sharply. And there are times when I positively soar. The Spider in me tempers the Hawk. The Hawk in me reminds me that sometimes it is necessary to be aggressive and to see sharply. And, while it’s wonderful to experience a meditative state, it is such a delight to soar. Malcolm: In addition to exciting stories, what memories, dreams and reflections do you hope your readers will carry away with them after reading the Forest Song novels? Vila: What the reader takes away from my books is really up to the reader. Each person brings her own experience, her own baggage, her own spirituality, and her own longings to the books she reads. Each person will take away an individual package of dreams and reflections. I don’t feel I can dictate or even suggest the “right” hopes, the “right” insights for the reader. I simply hope that each book sings to each individual in a way that feeds her soul. Malcolm: The use of the word “crone” in your Hidden Passages collection of stories straddles a paradox. In mainstream society, the seldom-used word is generally used to malign and discount older women in a patriarchal society. Yet, in historical matriarchal societies and in the Craft and goddess traditions, the word is used as a reverent term of endearment and respect. Did you have any second thoughts or concerns about using the word “crone” in your title or was it especially appropriate to the book’s theme and intent in spite of some mainstream connotations? Vila: I was very adamant about using the word “Crone” in the title of Hidden Passages. I deeply resent the fact that we dismiss old women in particular but old men too as useless dead weight when, given their experience and wisdom, they have so very much to offer. I think we would be a better society if we actually respected more the feminine principle of giving and nurturing life and if we understood down to the marrow of our bones how very much we owe those wonderful women who raised us. I grew up in the company of old women. I have always treasured them. And now that I am one, I value old women even more. I understand now that, while those wonderful women who raised me were old and wise and generous and dear, they still had all the eagerness and, yes, insecurities of youth. To me the word “Crone” encapsulates all that is woman—the maiden who is brash and flirty, fearless yet vulnerable; the mother who will sacrifice anything to give her child a better life, the woman who teaches and nurtures and worries and rejoices in and about her children; and the creature we see superficially as the Crone who knows pain, who has experienced death and loss and has endured anyway. The word Crone to me is not simply a title of respect. It is, in my opinion, the finest appellation anyone can call a woman. Malcolm: Your characters use a lot of herbs found growing naturally in the woods where they live. If one chanced by your log cabin, would they find you out in the woods gathering and drying herbs, and then using them in the teas and meals you serve at your table? Vila: Oh boy would they ever! Of course, I have an herb garden. Well, I wouldn’t exactly call it that. I’m not sure it’s organized enough to warrant the name “garden”. But I grow all kinds of culinary and other herbs as ground covers instead of grass. And I do cut from the herbs for cooking and other purposes during growing season. I dry herbs in autumn for winter use as well. My house smells like vegetable soup through the autumn with all the herbs drying. But I also harvest herbs from the woods. Mostly that’s just an excuse to go out into the trees and to feel the woodland energy all around me. But yes, herbs are very important to me. Not only do they make food taste fantastic, they have enormous healing power that many European countries still recognize. Hopefully, we’ll get back to more natural healing methods in this country too. Malcolm: Thank you so much for stopping by and chatting today.